This paper offers an exploratory analysis of social movement theory as it relates to the nonhuman animal rights movement. Individual participant motivations and experiences, movement resource mobilization, and movement relationships with the public, the political environment, historical context, countermovements, and the media are discussed. 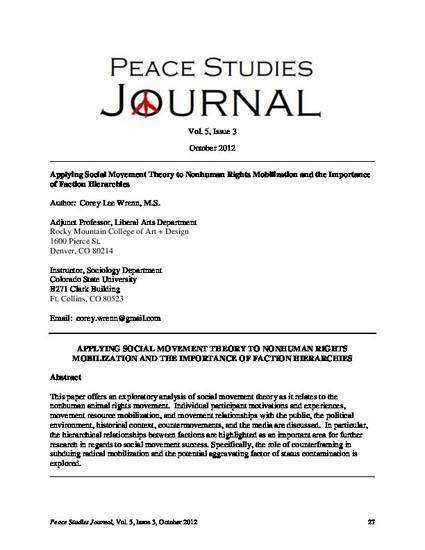 In particular, the hierarchical relationships between factions are highlighted as an important area for further research in regards to social movement success. Specifically, the role of counterframing in subduing radical mobilization and the potential aggravating factor of status contamination is explored. Wrenn, C. L., & Collins, F. (2012). Applying Social Movement Theory to Nonhuman Rights Mobilization and the Importance of Faction Hierarchies. Peace Studies Journal, 5(3), 27-44.